1. Boil the 2 cups of chicken broth, add in couscous and remove from heat. Let stand for 5 min and then fluff it with a fork. 2. 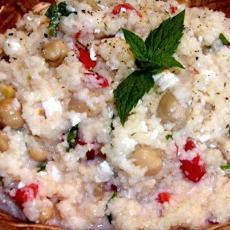 Add the tomato, chickpeas, and feta to the couscous. 3. In a small bowl, combine the yogurt, lemon juice, and salt and pepper. 4. Pour the yogurt mixture over the couscous and mix well to combine.